No set of golf wedge shaft reviews would be complete with covering the golf wedge shafts from True Temper. 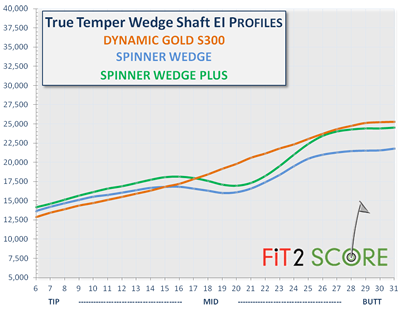 Most wedges come with a True Temper Dynamic Gold shaft. Shown here is the EI profile of the Dyanamic Gold S300. The S200 is used is some shafts because of its slightly different weight, but the profiles are not different enough that you could tell much difference. This entry was posted in Russ Ryden - Fit2Score, True Temper, Wedge Shafts on June 24, 2014 by Russ.